The V30 already had Qi wireless charging, so that aspect of the leak isn't really news. What's interesting (or not interesting, depending on how you're looking at it) is that the front of the V35 (model number LM-V350EM) looks exactly like the V30. But given the fact that the phone is called "V35" and not "V40," that's not unexpected. 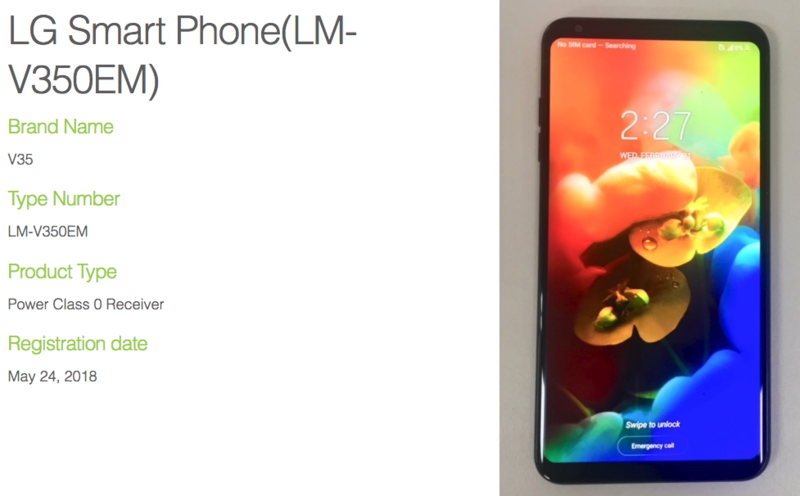 We'd actually already seen the V35 leaked as AT&T's upcoming LG phone - the one that it skipped the G7 ThinQ for. Evan Blass is the one who noted that the image, which had been circulated as a "live image," was found on the WPC's site. AT&T previously described the unknown LG device as a "different, exclusive" phone, and the information we're seeing here lines up with that. The phone's appearance on the Wireless Power Consortium means that a release is quickly approaching. Given AT&T's claim that the phone will be arriving this summer, we're probably only one or two months away from its debut. It'll be interesting to see how AT&T and LG differentiate it from the V30.